As promised, here’s a look at the Rules for Storytime posted in my room. After I got back from ALA Midwinter, I actually re-did these so that I could share the file, which you can access here: storytimerules. It is a PDF, and it is a large file (11×17), so you may have to use two sheets or shrink it to work in your storytime situation. Obviously, I have both English and Spanish on there. We have several staff members who do our translations and we tend to translate more based on Mexican Spanish since that what’s our population is mostly comprised of. I mention the rules as I introduce myself and storytime. 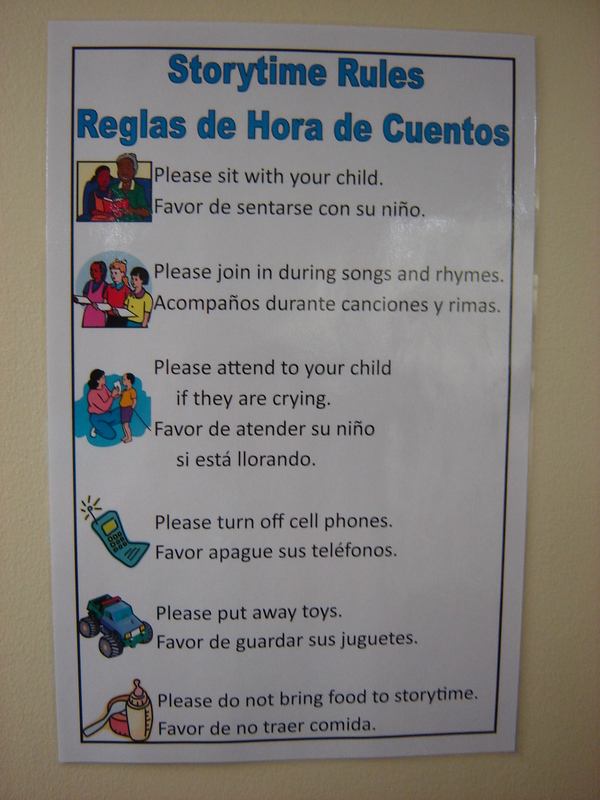 These are mostly rules for parents rather than for the child. If I need to redirect an adult, I will look at them and then glance at the poster. Most of the adults figure it out pretty quickly. Since I don’t have signs for the kids, I do a lot of attention getting exercises if they are all over the page. I often preface a book with “Who’s got Criss-Cross Applesauce?” and wait for everything to resettle before reading. I find that, generally speaking, the kids don’t need the rules written out as much as the parents do. Katie, lately I’ve found that our parents turn their cellphones off but whip out the tablet. Frustrating. I think we’ll have to change our sign to please put your electronics away!! Definitely. We haven’t had tablets pop up in storytime…yet. Though I expect that at some day, we might need to change our own signs! I love this. People sometimes underestimate the power of a simple, well-communicated rule. The pictures are a great touch, too! Thanks for sharing in PDF form; I bet a lot of librarians will print it out. Thank you! We’ve had it up for years, though the wording has changed. I’m glad I made the decision to re-do so I could offer the pdf file — I hope a lot of librarians find it useful! That is awesome, Katie! I think we’ll use it, too. Thank you for sharing your wonderful ideas! May I just point out that the rules are not accurately translated. I would love to send you some corrections if it is okay with you. Sure — what needs to be corrected? Fixed the verb and the accent. Stylistically, we do not use “celular” in the library at all. Thank you very much, though! Thank you for the rules. I have been having some problems with my group of parents and this will help a lot. You’re welcome! I hope it does help! Thank You Katie! I cannot thank you enough for your generosity in sharing these valuable resources. I am new to the Library World and Storytime, previously, I worked as a Pre-K Teacher. Storytime is an enjoyable time to share books with the kidos. Currenly, I struggle with this same situation of rules and like you said the parents need the rules the most. I was hoping to find a list of visual rules like this, I appreciate you sharing your knowledge & experience!